We believe it is important to continue having an honest conversation about the attitude that spreads HIV/AIDS as well as other health-related stigma. Stigma refers to a group of negative attitudes and beliefs that cause people to fear, reject, avoid, and belittle people with certain illnesses or conditions. It involves labeling people as “different.” Stigma is a major problem for individuals living with HIV/AIDS, mental illness, genetic disorders, and many other health issues. Despite medical advances in HIV care, the disease continues to spread globally. Even when there is mental health care availability, people continue avoiding treatment. It is our belief that we need to include stigma in the research, conversation, and prevention of these illnesses. 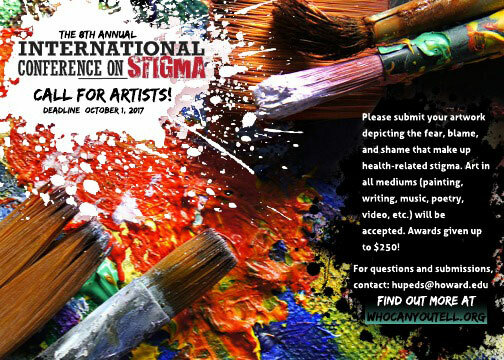 We would like to invite you to submit artwork in the form of artistic paintings, drawing, essays, poetry, songs, or any art medium surrounding the topic of stigma. Prizes will be awarded, and winning pieces may be featured at the 8th International Conference on Stigma: Research and Advocacy in Action to be held at Howard University Blackburn Center, Washington DC on November 17th, 2017.